Now, we don’t know exactly what they are defining as “liberal.” I would guess more than a few define it as President Obama’s philosophy which I think is more accurately defined as “moderate.” (He said himself that he would be considered a moderate Republican back in the 80s.) It is curious that this increase in self-defined liberals seems to have jumped just in the last couple of years, so it’s hard to say it’s all Obama driven. In any case, there are two factors here that are of interest. The first is that the demonization of the word itself seems to have faded a bit. 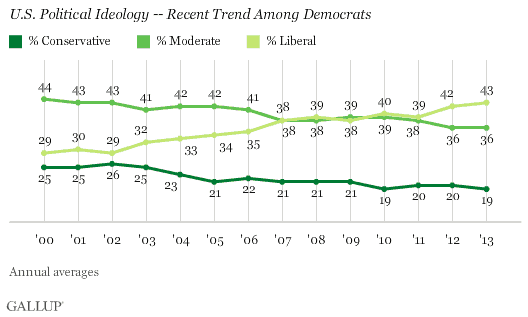 If 43% of Democrats are now willing to call themselves liberal it is obviously no longer a shameful label. I don’t know why that’s happened, but perhaps it’s just as simple as the fact that the conservatives have been making such asses of themselves in recent years that normal people are no longer as influence by their opinions. But I’m more interested in the fact that 43% of one of the major parties is a big constituency. Now it’s not as large as the conservative constituency in the Republican Party, which holds a large majority, but it’s a plurality and it’s growing. I think the Party poohbahs had better start reckoning with the idea that they need to show that faction just a little bit more respect than they’ve been showing it in the last few decades. At the very least they need to stop insulting them.